Gift of Frederick Sturges, Jr.
Frederick Sturges [d. 1917], New York, and Fairfield, Connecticut; his son, Frederick Sturges, Jr. [1876-1977], New York, and Fairfield, Connecticut; bequest 1978 to NGA. Although family tradition held that all of the Durand paintings in the Sturges collection were first owned by Jonathan Sturges, no evidence supports that assumption for A Pastoral Scene. Even though the evidence is inconclusive, it is more likely that Jonathan's son, Frederick Sturges, Sr., purchased the painting from the artist in 1858. In June 1858 Frederic Sturges, Sr., wrote to the artist: "I beg to enclose my check for five hundred and fifty dollars and I would again thank you for my beautiful picture" (letter of 16 June 1858, Durand papers, New York Public Library, as quoted in David B. Lawall, Asher B. Durand: A Documentary Catalogue of the Narrative and Landscape Paintings, New York, 1978: 120). 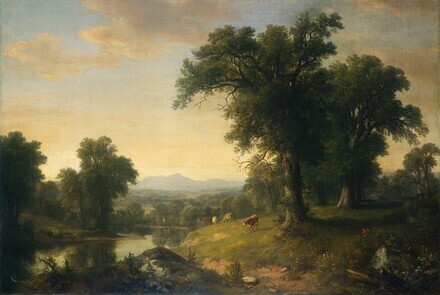 Lawall (letter of 14 April 1980 in NGA curatorial files) agrees that A Pastoral Scene may be the painting referred to in this letter, but notes that $550 would have been an appropriate price in 1858 for a painting measuring 30 by 40 inches, considerably larger than Pastoral Scene. Paintings by Durand of the size of the present example likely would have cost about $250 $300 in 1858 (see, for example, Lawall 1978, nos. 206 and 236), and even smaller pictures sold for about $100 (letter from Sturges to John Durand, 22 June 1858, John Durand papers, New York Public Library as quoted in a letter of 2 April 1982 from Wayne Craven in NGA curatorial files). The support is a fine, plain-weave fabric. A thin white ground was applied in one smooth layer. The paint surface was built up through many layers, with glazes often employed. Although there is some impasto in the whites, the brushstrokes are generally restrained, with minimal texture evident. Drying cracks and wrinkling are visible in several areas, most notably in the landscape of the middle distance and the mountains at the center. In 1979 the painting was relined, discolored varnish was removed, and the painting was restored. The most disfiguring areas of craquelure and several small losses along the edges were inpainted. The varnish has not discolored. Lawall, David B. Asher B. Durand: A Documentary Catalogue of the Narrative and Landscape Paintings. New York and London, 1978: 120, possibly no. 225. Williams, William James. A Heritage of American Paintings from the National Gallery of Art. New York, 1981: 113-114, repro. American Paintings: An Illustrated Catalogue. National Gallery of Art, Washington, 1992: 162, repro. Cushman, Helen Baker. The Mill on the Third River: A History of the Davey Company. Jersey City, New Jersey, 1992: 23, 24, repro. Kelly, Franklin, with Nicolai Cikovsky, Jr., Deborah Chotner, and John Davis. American Paintings of the Nineteenth Century, Part I. The Collections of the National Gallery of Art Systematic Catalogue. Washington, D.C., 1996: 142-144, repro.